“It’s too pretty to eat,” I remarked to Silvia, the cute blond waitress who had brought it to me. Jokingly, she took it away, briefly, before she brought it back. It was a work of art. It really was (almost) too pretty to eat. However, I bravely jumped in, scooping up the delicious mascarpone cream along with the coffee flavored blob of flavor. I broke off a branch of the intricate tree made with ladyfingers, hanging over the tasty dessert. Each dish at Ristorante Riviera was a remarkable display of art, with just the right mix of flavors. 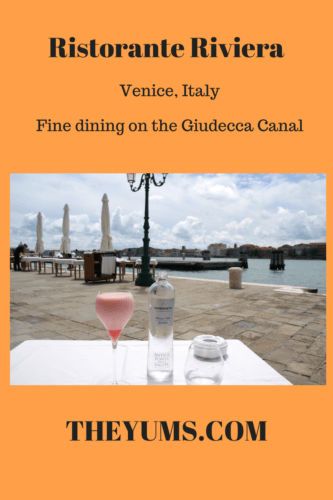 Sitting at my outdoor table overlooking the Giudecca Canal, time slowed down as I savored each dish, each with a perfectly paired wine. Two and a half hours passed, and when I finally finished, I reluctantly said Ciao and was on my way. Owner G. P. Cremonini has created a wonderful dining experience at Ristorante Riviera in Venice. A charming, charismatic gentleman, Mr. Cremonini spent much of his time in lively conversation with his customers. You could tell he enjoyed what he did and was very proud of his fine establishment overlooking the waters of the lagoon. Location: Fondamenta Zattere al Ponte Longo, 1473, 30123 Venice, . Almost directly south of the train station, Ristorante Riviera is on the southern coast of Dorsoduro, overlooking the Giudecca Canal. Menu: Ristorante Riviera in offers an innovative tasting menu to diners. Guests can order the 7-course fish or meat menu or the 11-course fish and meat menu. Some a la carte dishes are also available. Fish dishes include a lightly marinated raw fish selection, crab served with peanuts and aromatic herbs, and a flavorful fish soup. There is also a red mullet served with courgette flower, onion, cauliflower, and anchovies, and oysters with lard and sea fennel. Meat dishes include the wonderful gnocchi di stracchino, tender gnocchi filled with stracchino (soft) cheese and braised beef cheek with apple mustard. Other choices were the delicious bone marrow and oxtail and a tasty three stroke pigeon served with rhubarb, leeks, and cherries. Another meat dish is the chopped raw beef with different maturations served with egg, olives, and seaweed. For desserts, try the artistically presented tiramisu, buffalo ricotta with rice, chocolate, fruits and aromatic herbs, or the olive cake with chocolate, hazelnut, and basil. Thoughts: Venice is famous for great restaurants with wonderful tasting food and innovative presentation. Ristorante Riviera upholds this reputation – and then some. I was at the restaurant for two and a half hours. I enjoyed my entire time there. Being educated about the dishes and the wines by the waitress, the hostess, and by the owner was fascinating. I relaxed as I watched a cruise ship pass by bringing in thousands of tourists eager to enjoy the many wonders of Venice. I saw tourists and locals strolling along the canal. I watched other diners enjoying their meal, couples engrossed in their gelato, and several people leisurely walking their dogs. I just had a general sense of contentment, soaking in that special Venetian atmosphere. The food and the wines were outstanding. The excellent gnocchi stracchino with beef cheek is one of my favorite dishes of all time. The aromas of the oxtail with bone marrow was amazing. In fact, it smelled so good a friendly neighborhood puppy came to my table, stood on his hind legs, and begged me to share my tasty dish. His owner called him away, and I somewhat guiltily finished the oxtail. I’ll never forget the tiramisu. I actually did a double take when Silvia brought out this fantastic dessert. The trunk of the tree, with branches and limbs delicately swirling outward, was definitely a piece of art. Also, the pigeon was served on a crystal plate with rings of blues, reds, pinks, and oranges surrounding the perfectly cooked bird. What a sight – and what a taste. Ristorante Riviera is expensive. But when you’re in Venice, and you want that extra special meal that you will always remember, it’s the perfect place to create those memories. And when they say cooking is an art, you will know exactly what they mean. Prices: 77-course tasting menu, fish or meat, is 105 Euro. 111-coursetasting menu, fish and meat, is 160 Euro. Wine pairing, 7 glasses of wine, is 55 Euro. Disclosure: The author received a complimentary meal on his visit to Ristorante Riviera in Venice.